Florence was born September 20, 1869, just a few years after the Civil War. Her parents, Dave and Katie Skipper, were only 20 years old and had not been married long. Dave probably helped his father farm their property near Round Mountain north of Solgohachia in Conway County, Arkansas. Dave had migrated with his father, Joseph Skipper, from North Carolina via Tennessee in the mid-50s. Katie was from Tennessee. Things in rural Arkansas were difficult after the Civil War and there was some animosity toward the Skipper family because Joseph had served with the Union Army. He was 55 when Florence was born. Florence's grandmother, Louisa Skipper, was 38 years old. In spite of the difficulties following the war, the Skipper family seemed to get along pretty well on their farm. Probably all their neighbors were in similar circumstances and they accepted things as just a normal part of life. Florence was a teenager during the 1880's and the linked article gives some information about what life was like in rural parts of the United States then. During those years three more sisters and two brothers were added to the family. Moses and Nancy Krisell lived in the Lanty community a few miles north of the Skippers. They had a son named John Franklin, who was born March 17, 1869, just a month before Florence. On October 2, 1887, when they were almost 18, Florence and John were married. Their first child, Leonard Earnest, was born the following year on August 12, 1888. Florence was almost 19. There is a good possibility that Florence went back home to have the baby with the support of her grandmother, mother, aunts, and sisters. John and Florence settled in the area and had eight more children during the next 13 years. When Florence's brother, James Arthur Skipper, was 17, Florence had a son and named him James Arthur Krisell. Florence died during childbirth on September 26, 1903, at the age of 34. Apparently many years later a small, simple block of granite engraved "MRS. J. F. KRISELL 1869 - 1903" was placed to mark her grave in the Lone Grove Cemetery just west of Round Mountain. When she died, her nine living children ranged in age from 4 to 15. This must have been a major tragedy for the family. Dave and Kate had lost a baby son, but this was their first daughter, a mother of nine and still very young. 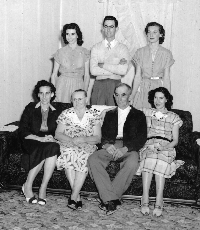 John and Florence's children posed for this photograph at a family reunion in 1951. Posing with them is John's brother, Jim Krisell, and Florence's sister, Lou Treece. In 1951 the children ranged in age from about 52 to 63. I have another B&W pose in which Ellen is turned toward her sister and a color photo taken at the same time, but in it Dave is more centered between Cora and Fanny. Leonard Ernest Krisell (1888 -1959) married Jeanette Evans. Mary Frances 'Fannie' Krisell (1889 - 1982) married Elmer Bizzell. Their youngest child was Elmo Bizzell. David Lindsey 'Dave' Krisell (1891-1968) married his Uncle Jim Skipper's sister-in-law, Willie Franklin Noland (1894 - 1979) in 1912, so Dave and Willie's children were 'double kin' to Jim and Jo Skipper's children. 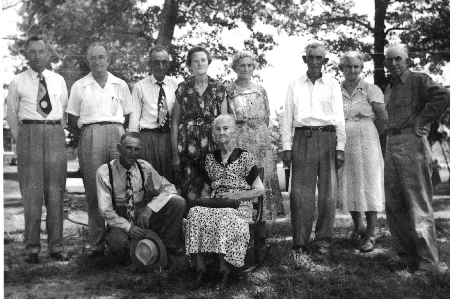 The families lived near each other in the England, Arkansas, area and maintained a close relationship through the years. Dave was my father's first cousin, but also an uncle-in-law. Jim and Jo's children have died, but several of Dave and Willie's children are still living near the area where they all grew up. Walton Krisell and Betty Jo Dabbs provided some valuable Krisell family information for this article. Nancy Deloris (Lora) Krisell (1892 - 1981) married Roy Hillis. Cora Kathrine Krisell (1894 - 1953) married Mannie Noland. Lou Ellen Krisell (1895 - 1979) married Charles Fletcher Bizzell in 1916. They settled in the Lanty area and their three children, Betty, Murl, and Lucien, were my mother's age and were friends in school and on through life. They were my father's age, too, of course. Their mother, Ellen, was his first cousin. Lucien and his wife have moved back to the family property at Lanty. He provided some family information. Murl is retired and lives in the Little Rock area. Betty died several years ago. Moses Hobert Krisell (1896-1971) married Jessie Edna Matthews (1904-1982) in 1922. They lived at Lanty and later moved to the England area. After retiring they moved to Conway. They had 9 children. M. H. Krisell (deceased) of Benton, Kansas. J.W. (Dub) Krisell (deceased) of Damascus, AR. J.M. (Jim) (Jammer) Krisell (deceased) of Benton, AR. Mary Dean Krisell Staton of Pine Bluff, AR. Ralph Krisell of Fremont, California. David Krisell of North Little Rock, AR. Paul Krisell (deceased) of Vilonia, AR. Linda Krisell (deceased) of Conway, AR. Olin Quincy 'Bob' Krisell (1898 - 1962) married Ollie Bruce. James Arthur Krisell (1901 - 1979) married Evelene Hurst.